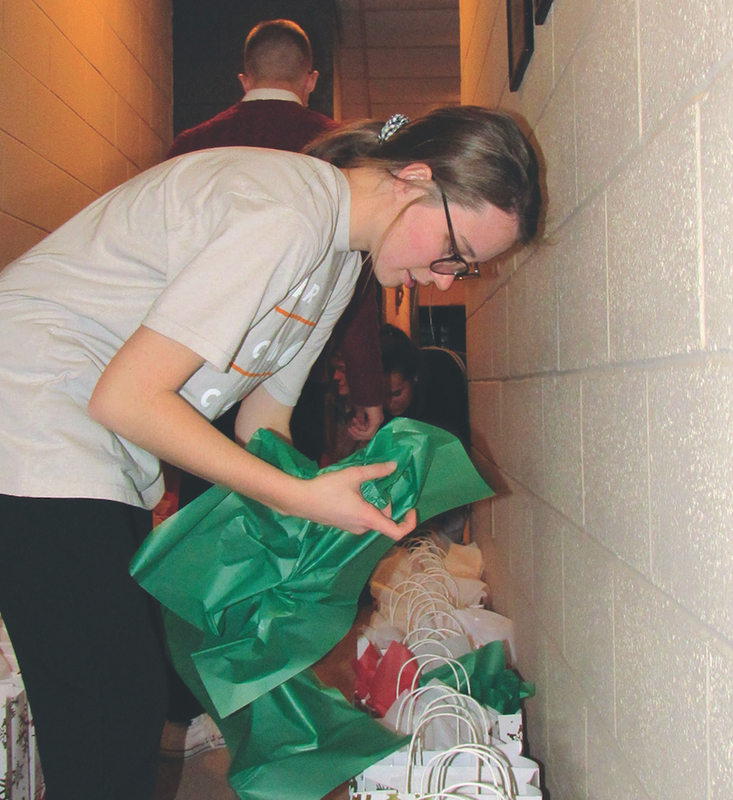 K-State sophomore and Prince of Peace, Olathe, parishioner Emily Sweat helps fellow St. Isidore’s students assemble care packages for community members in need through the Common Table program. MANHATTAN— Saint Isidore’s Catholic Student Center here is usually a busy place during the last week of each semester. It is filled with final exams, extensive projects, long essays and hours of studying. The center stays open 24 hours a day during that week, so students can use the building for studying, and nearly every meeting room is full of students hitting the books. But during finals week this past December, there was a group of students doing another kind of project. The upstairs hallways were lined with gift bags and an assembly line of students dropped small items in each bag, one by one. The air was filled with Christmas music and punctuated by outbursts of laughter. These students were creating care packages for people in the Manhattan community who were homeless or in need. The St. Isidore’s leadership team made it a priority to organize more service opportunities for students this year, and the fruits of these acts of service are evident at St. Isidore’s and in the larger Manhattan community. The leadership team service chairs, Maggie Doll and Emily Sweat, led the charge for finding service opportunities for students. Doll, a senior in social work from Salina, said she and Sweat had looked at past service projects, and while St. Isidore’s students had an overwhelming desire to serve, they didn’t know what opportunities existed within the Manhattan community. “At the beginning of the semester, we asked many students what service they have done in the past or what kinds of service opportunities they would like to participate in,” said Doll. “We had a lot of ideas, but struggled putting them all into action. Doll and Sweat reached out to Common Table — an organization in Manhattan that provides free meals every evening, and breakfast and lunch three times a week. The meals are hosted, prepared and served by volunteers at several Manhattan churches. “The Common Meal volunteers suggested that we volunteer by coming and eating with those who come to have a meal. We have students come and eat twice a week with the guests of Common Table,” Doll said. In addition to eating with people in need at Common Table meals, St. Isidore’s hosted a winter clothing drive for Common Table. St. Isidore’s students made several trips to the Common Table clothing closet to deliver donated items, but the donations kept rolling in. So they reached out to the FIT closet in Manhattan, which is a store for USD 383 students and families who qualify for free and reduced lunches. Sweat, a sophomore in architecture from Overland Park and a member of Prince of Peace Parish in Olathe, said the response and donations from students has been a blessing to see. “My hope is that these acts of service will show the people we are serving that they are valued, loved and appreciated by all of us,” Sweat said. St. Isidore’s students have also donated time to helping people in the community clean up their yard, and have assisted at the Manhattan Catholic schools auction. The Christmas gift bag project was organized by Common Table. Doll said they are still making plans for the spring semester and hope to continue serving with Common Table. Father Gale Hammerschmidt, chaplain of St. Isidore’s, said watching the students extend Christ’s love in the community has been a joy. “I am very proud of our students and their initiative on this project,” said Father Hammerschmidt.